‘Visual influence’ is the term used to describe the visibility of the wind turbines from the surrounding area. Locations from which at least one blade tip can be seen. Figure I.4.2 shows an example ZVI for a wind farm, generated using a WFDT. The variation in colours represents the proportion of the wind farm that is visible from viewpoints anywhere in the wind farm vicinity. Such maps tend to exaggerate the actual visual effect of the wind farm, as they do not clearly indicate the effect of distance on the visual appearance. They are also difficult for non-specialists to interpret. 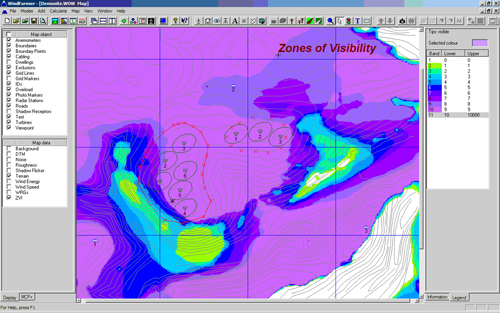 Therefore it is also common to generate ‘visualisations’ of the appearance of the wind farm from defined viewpoints. These can take the form of ‘wireframe’ representations of the topography. 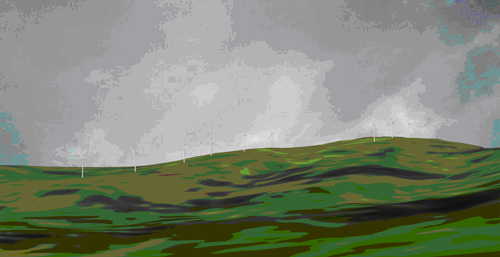 With more work, photomontages can be produced in which the wind turbines are superimposed upon photographs taken from the defined viewpoints. 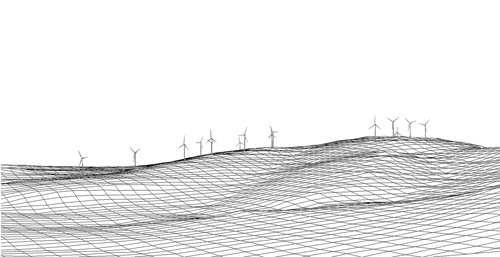 Figure I.4.3 shows an example wireframe representation of a wind farm generated using a WFDT. Figure I.4.4 shows the same image after rendering software has been applied and Figure I.4.5 shows the same image as a photomontage. 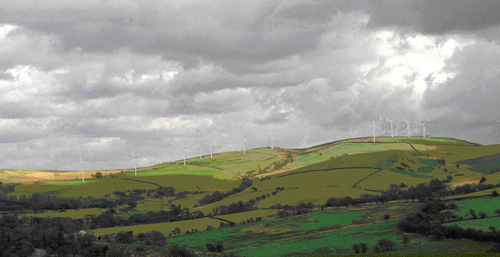 Other factors also affect the visual appearance of a wind farm. Larger turbines rotate more slowly than smaller ones, and a wind farm of fewer larger turbines are usually preferable to a wind farm of many smaller ones. In some surroundings, a regular area or straight line may be preferable to an irregular layout.